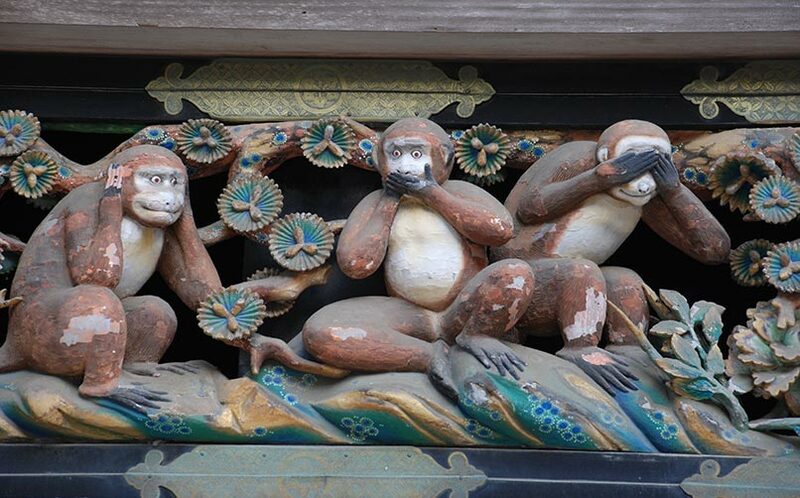 You’ll find a carved panel of the three wise monkeys above the door of the Tshogu temple in Nikko, Japan. The carving is one of the oldest representations, dating back to the 17th century and was erected in honour of Shogun Tokugawa Ieyasu. On the panel, the monkeys are sitting in a row – the first covering its ears, the second its mouth and the third its eyes. But no matter the order of the monkeys, they’ve come to embody the proverb “See no Evil, Hear no Evil, Speak no Evil”. Purists amongst you have spotted that their original Japanese names are Mizaru, Kikazaru and Iwazaru. But outside of Japan, you’ll see the monkeys’ names given as Mizaru (See no Evil), Mikazaru (Hear no Evil) and Mazaru (Speak no Evil). This western version, Mazaru, is a little easier to pronounce – we hope you’ll allow us a little creative licence. Legend tells us that the monkeys were sent by the gods as observers and messengers. We’re now Mazaru. We’ve been sent by the gods to help you Speak no Evil.